Toy Fair is coming up soon, and Hasbro has given us the first look at its new Disney Princess Comic Minis line ahead of the big show! 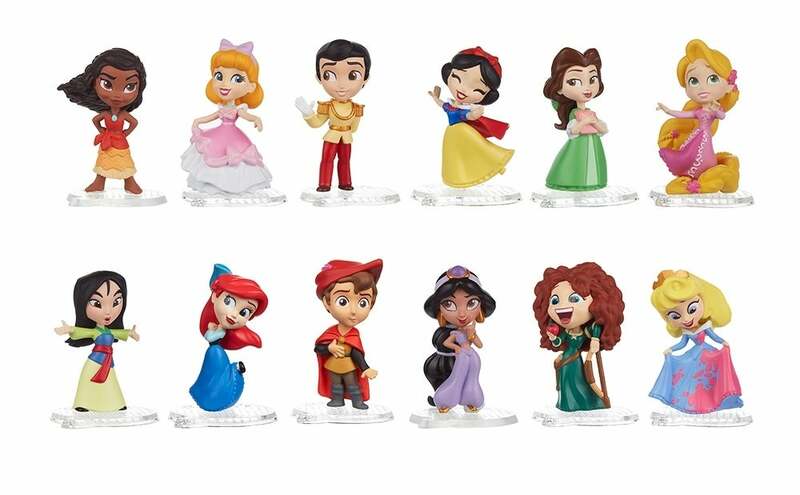 The Disney Princess Comic Minis line features an assortment of 12 stylized versions of some of Disney's most iconic characters, all sized in a two-inch scale. The line is based on the Disney Princess comic strip series from Joe Books and will come in individual blind box packages that will be released every three months. As you can see in the image below, we've got your first look at the assortment, and the line is rather adorable. The 12 individual figures in the line include: Moana (Moana), Aurora (Sleeping Beauty), Prince Charming (Cinderella), Snow White (Snow White and the Seven Dwarves), Belle (Beauty and the Beast), Rapunzel (Tangled), Mulan (Mulan), Ariel (The Little Mermaid), Prince Phillip (Sleeping Beauty), Jasmine (Aladdin), Merida (Brave), and Cinderella (Cinderella). All of the characters are delightful, but we especially love Moana's determined expression, Snow White's carefree saunter through the woods, and Jasmine's smirk, though Merida's hilarious chilling on a bow to eat might be the best of the bunch. You can check out all of the figures in the image above. The Disney Princess Comic Minis will cost $4.99 each and will release in the fall. 2019 is going to be a busy year for Disney at the movies, an that includes its live-action Aladdin film that will bring Jasmine to the big screen. The iconic Disney Princess will be played by Naomi Scott in this live-action adaptation from Guy Ritchie, and hopefully, we'll get to see a full trailer for it soon. Mulan will also be making her way to the big screen in 2020 as a live-action adaptation, which will star Yifei Liu in the role of Mulan. There's also a rumored Little Mermaid film in development, though nothing official about casting for that movie has surfaced yet. It looks like the next few years will be packed for the Disney Princess line, and that's good news for fans. Which Disney Princess figure is your favorite from Hasbro's new line? Let us know in the comments!